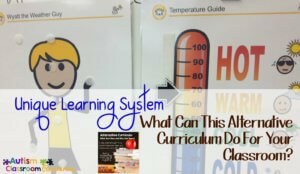 Today I am continuing with Nicole’s and my series on alternate curricula and want to talk about the Unique Learning System. 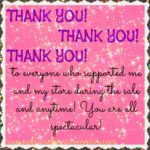 First I have to thank everyone who shopped my TPT store and anytime! I love that you all make it possible for me to continue to do what I love as a career! 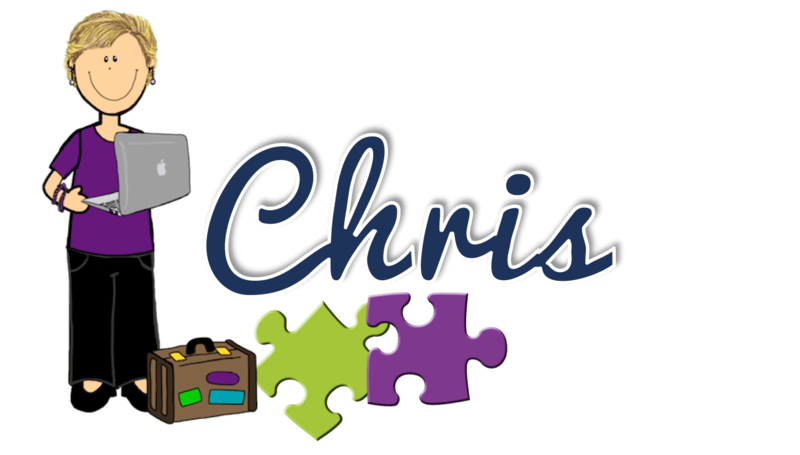 I love making materials for your classrooms and building our community of those who work in autism and special education. All of you are truly special for the dedication and passion you bring to your jobs and your lives. Thanks for all you do! Many of you use or have heard of the Unique Learning System (ULS) or have used its sister product News-2-You. I frequently share information from them and particularly their free summer curriculum unit to help people structure ESY. It also frequently comes up on the Facebook page when I asked about types of curricula. I also wrote a few posts about it several years ago. The one on new resources is pretty out of date, but here is one that focuses on what it is, here is a guest post from An Exceptional Education on how she uses it in her classroom, and finally here is one about organizing materials within the ULS–because if you print them there are LOTS of papers to organize. The ULS is interesting because it appears to be one of those things that many people love and find to be a lifesaver while other people find it overwhelming and still more just don’t care for it. So let me start with what it is, and then I’ll share a bit more about some of the good, bad and not really ugly stuff about it. The ULS is a comprehensive curriculum in that it ties into the core curriculum and most state standards. Comprehensive as a curriculum means it covers a broad range of skills–it is not intended to mean that it is everything you need. It is an online curriculum for which you buy a subscription each year for a band of grades. Within the curriculum there are 3 levels of skills. Many of the highest level skills may not be high enough for some of your students. This is a curriculum designed specifically for students who have significant disabilities and are learning from alternate standards (or whatever that is called in your state when the student qualifies for the alternate assessment). The three levels works great in Florida because it parallels our 3 levels of participation. That may or may not be true in your state. In Alabama there are 4 levels but it would still translate pretty well there. 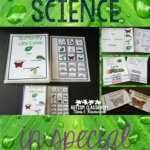 It includes some reading and math activities, but it is designed to be a social studies and science curriculum with math and reading built into it. Like News2You with is an adapted newspaper, the ULS is organized around themes and often those themes are influenced by current events. So let me share some bullet points about what the ULS IS and what it IS NOT. The ULS is a comprehensive curriculum that provides materials for preschool through transition to adulthood ages. You subscribe to the band that matches your class’s chronological age. This is critical because one of the things I love about the ULS is that it is developmentally appropriate skills being taught with age-appropriate materials. 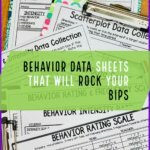 They will help you make the shift for students who need a more functional approach to curriculum without losing a focus on the core standards. Just a note: Don’t buy the strand of where your children are functioning. My goal is to prepare him to be as independent as he can be. The ULS is a curriculum-based assessment that allows you to track students’ skills in relation to the core curriculum (state standards) over the course of the year. It has computerized assessments that you can use, or you can print them out if your classroom or student needs them. It is designed to place the student in a level of the curriculum and you can track if skills are being mastered during the year. This is a piece of the ULS that I know the creators have spent a good bit of time on that many people do not take advantage of. If you use the ULS I strongly recommend looking for some training or spending some time to become familiar with this part of the curriculum if you haven’t. A curriculum-based assessment is a form of data that shows growth over the course of the year–or highlights areas of difficulty–and this is particularly important for students who are complex enough to be receiving the alternate assessment. 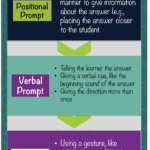 Another thing I really like about the ULS is that it is set up for learners who need augmentative communication and have alternate methods of responding to questions. It is very symbol-based, using its own symbol set called SymbolStix which I really like as much as other symbol-based options out there. 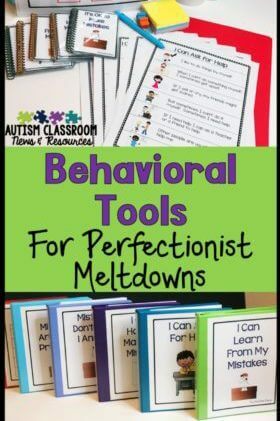 The materials come with options for manipulatives and visual supports so you don’t have to add them in to the activities. That to me is huge because it saves a lot of time. Let’s face it, in this day and age, we are all focused on the standards, even for those students who are so far away from grade level that it makes little sense. Is it really important that he can identify the Civil War battlefields in his state when he can’t tell me his name? Well the state says it is, so the district says it is, so your principal says it is, and so on. I love the ULS because it does this for you. It may not identify every alternate standard in your state, but it will give you materials that are already adapted and developed around the science standards and the social studies standards. In addition to the monthly thematic units, you will have access to science units and social studies units additionally that you can use to meet your alternate standards goals (or if your state doesn’t have alternate standards, that you can use to meet your state standards with modifications). I know that many people feel like the curriculum should give you everything you need, but that just isn’t possible. It gives you a basis to work from. Materials still need to be individualized and adapted for some students. You still need scientifically based curricula for teaching critical skills (more on that in a minute). You will still need to use some of your own books and teaching materials and will need materials for students’ IEP goals that may not be part of the ULS. Remember that the ULS is based on the state standards. It includes some additional information and support for functional skills, like life skills. But let’s face it, life skills aren’t part of the core curriculum, but our students still need them. So we need to add them in. Some materials, like Wyatt the Weather Guy in the title picture above are designed to work on teaching skills in a functional manner–it is important to know how to dress based on the temperature and the weather. Many of these materials are not part of the monthly lessons so people miss them. Make sure you are taking advantage of everything that comes with the ULS. For instance, you will probably want to add some books and literature into the units, Only 3 books come with the monthly units–however, there is a whole library of leveled adapted books available to you as a subscriber. This is one I hear frequently. I asked what people use for teaching reading skills and they tell me the ULS. The ULS has materials for practicing math and reading skills that are adapted from the state standards. However, the majority of our students who are using the ULS are going to need more explicit instruction from a scientifically based reading curriculum and from a scientifically based math curriculum. I’ll do a run-down of those in future posts (my list is mounting! ), but the ULS doesn’t intend to be those types of curriculum. There are many opportunities to use the ULS materials in whole group instruction, particularly now that they have adapted it for interactive whiteboards (Thanks ULS!). However, it does not all have to be used that way. I meet many people who think that they are only supposed to use the ULS as a whole group and that their students need more individualized instruction in smaller groups and therefore it’s not appropriate. I have no idea really where this idea comes from, but felt it was important to address. When I run classrooms, I use a combination of the ULS materials as my “curriculum” and other materials for teaching IEP goals when I do small group direct instruction. I also use their materials in whole group, but that’s not all I do. I know that as soon as I wrap this up, I’ll think of some other things. Long and short, I really love the ULS. I think it’s a great bargain for what you get, if you take advantage of it. Even thought it’s not everything I need, and there are still materials to prep, it still puts me a step ahead when I set up a classroom because it has the materials already adapted, so I don’t have to do it. And I’m all for anything that makes life easier! I’m curious to hear your thoughts on the ULS and what you like or don’t like about it. It certainly isn’t the answer for everything or every classroom, but it can provide some good material. So leave me a comment with your thoughts and let’s have a discussion. 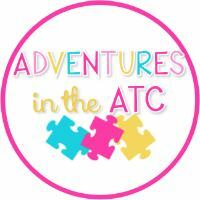 And while you are waiting for me to reply, check out Adventures in the ATC’s post about the VB-MAPP and come back next week when I will be talking about functional curricula and Nicole will be talking about the Hawaii Early Learning Profile (HELP). I love this series! Thank you! I’m a homeschooling parent and have two kids with autism. We are trying Unique for the first time this year. Thanks, I would love to hear about what you think about it when you implement it! Chris, thank you so much for this post! I’ve been hearing so much about ULS but it’s a curriculum that I have no experience with. My question is how do people find time to fit this into their day? With IEP goals, general ed classes and functional skills, I have such a hard time fitting in science and social studies! 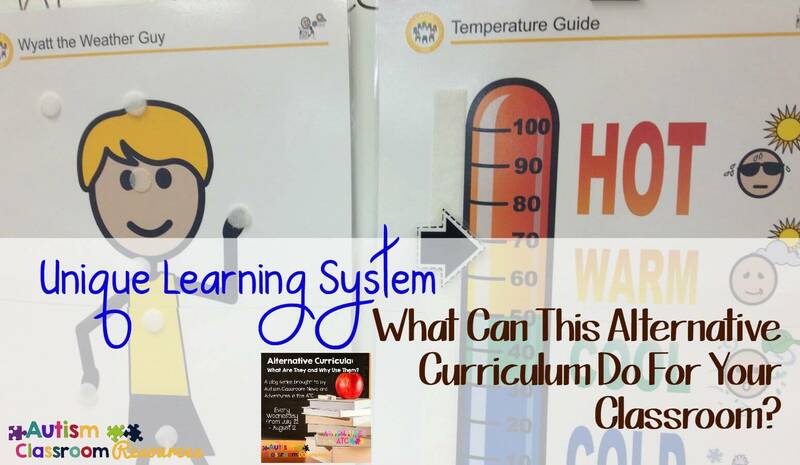 Have you seen the new lesson plans they just developed? They came out today. It looks like it might help with understanding how the lessons should be delivered…..
Actually I just heard about them and have to look into them. It does sound like it will address a lot of the issues! thanks for letting me know! Thanks for a good, comprehensive post about ULS. I know a lot of districts who use ULS, and many teachers love it. But you’re right, it isn’t everything you need. Teachers are so desperate for materials because they’re rarely given much in the way of curriculum for these kids. and I are supporting brand new secondary programs. We have been looking for this type of curriculum! Thank you again! Wonderful! Thanks Linda. I hopefully will be adding a post or two about it in the near future. I’m homeschooling my 6 year old through a charter school. He is high functioning but needs a lot of visual supports. His Special Education teacher suggested ULS and my husband and I researched the curriculum and we like it and feel it would be great for my son. Also, I’m little concerned that our Charter School will set us up with ULS with no training. Is the system challenging to learn? Homeschooling wasn’t my first option for my son, but our school system is overcrowded and under funded and not a very positive learning/ social environment for my son who has a lot of sensory issues and social communication problems. I just couldn’t put him through that! I think with the ULS you may find a need for a reading and math curriculum, but it depends on the student and the goals you need. I would try the ULS and see what works for you. I don’t think it’s challenging to learn and if you have access to it, they have lots of webinars and training you can attend to get up to speed. It just takes some time to poke around in it and find things at first. Hope that helps! Thanks for reading and good luck with your son! ULS is a great program for our son’s reading curriculum. I’m not fond of the math portion of the program. A few years ago, we transferred our son from the public school system to a private (yet funded by the public school) school which has a few different classroom teaching environments. For years, I’ve been trying to understand the relation of the number levels of the ULS. Can you please either post this information or advise me where I can find it? I’ve searched the internet for answers and am not successful :-(! He was transferred to a school/program for kids with Autism. Hi Christine, you would do best to ask that question to the people who publish the Unique. I don’t have a current copy to be able to evaluate it extensively…but the ULS folks should be able to help you with it. Would you recommend this curriculum for a student with Down Syndrome who is on the adapted curriculum, but is trying to get back onto the general curriculum? Will it provide the necessary instruction to teach reading and writing skills required for the 2nd grade? Yes I would but you would have to make a decision based on the skills and needs of the specific student.